The M6 Toll motorway is not being used by many Birmingham companies because it is "too costly", according to a business group. The Birmingham Chamber Group's survey of nearly 100 firms found 78% did not use the road because of its price. 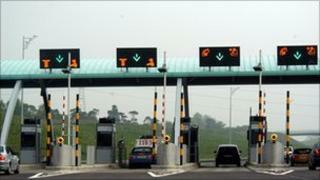 The toll road costs £5 for a car to use and £10 for a lorry following a price rise in March. Midland Expressway, which runs it, said more vehicles were using the road and there would be further investment. The road links junction four of the M6 at Coleshill, Warwickshire, with junction 11 near Cannock, Staffordshire. The Birmingham Chamber Group said none of its 100 members surveyed used the road on a daily basis and 39% never used it at all. Midland Expressway said the toll road was a success and pointed to figures which show its usage increased by 5.2% between July and September and 5% during the previous three months. The figures showed the average number of users had risen to 44,089 a day compared with 41,898 a year ago. The chamber welcomed the increase in users but said the number would increase further if the prices were lowered. Will Rogers, chamber policy adviser, said: "Many people still feel that the road is still too highly priced to provide a viable alternative to the heavily-congested M6. "For regular users, it's not an economic alternative to the M6." He added it was important to raise awareness about the toll road which cut journey times by an average of 20 minutes and saved on fuel. He added, however, there may be fewer reasons to use the toll road once the M6 widening scheme was complete. Transport Secretary Philip Hammond said the toll road was built with private money and the private operator had to decide on its charges. Tom Fanning, from Midlands Expressway said: "The toll road remains excellent value for money considering the benefit of bypassing the congestion on the M6." There were no plans to reduce the toll charge, he added.